Another great night of witnessing this past Monday at Westminster Mall. There were fewer people there than last week but we were able to get into several great conversations. Click here if you don't see the embedded media player above. On Saturday, Tracy, Gordon, Skyler, and I headed over to the Huntington Beach Pier to have lunch at Ruby's and then pass out Gospel Tracts and witness. 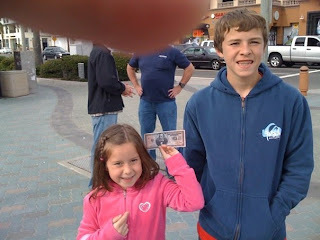 Ray Comfort was there as well as Steve Sanchez's team from Hope Chapel Hermosa Beach. A couple of the CCCM guys were there too. 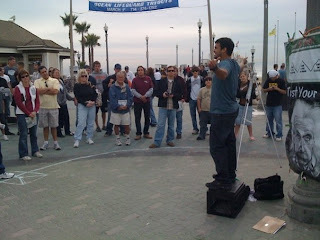 Below is a picture of Chad from CCCM open-air preaching. Here's an super-practical way to share your faith... one burger at a time. All you need is an appetite, a vehicle (to take through the drive-thru), a couple dollars, and some gospel tracts. Here's what it looks like. Notice the big smile on the cashier's face. This really does bless people! Click here if you don't see the embedded YouTube video. Last night was a great night of witnessing at the Westminster Mall. I was teamed up with SCCA's very own Rich Norman, and Norman. There were a lot more folks hanging out at the mall last night and most everybody we approached were willing to talk with us which made for some great conversations. Here's the audio for the conversations we had last night. Please pray for Steven & Brady, Junior, Federico, & Orlando, Blanca, Blanca, & Christina, and the group of teens. What a night!! Soli Deo Gloria! 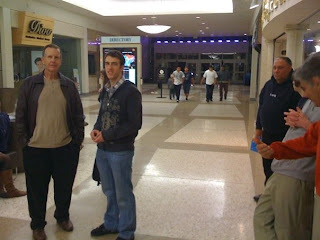 Last night was wet and cold so the team went to Westminster Mall so that we could witness where it was warm and dry. I was teamed up with John last night and we were able to hand out lots of tracts to those passing by. However, we were having a bit of a hard time getting conversations started... everybody seemed to be in a hurry to get their shopping done. Finally we approached a young couple who were happy to hang around and talk with us. They had never really given much thought to eternity but thought there must be something out there after we die. The young girl said that maybe good people go to a "good place" and bad people come back to try it again. We explained that the bible teaches that there is a heaven and a hell and that the standard for entering heaven is God's moral law - the ten commandments. We took the couple through the "Good Person" test during which they admitted that they had broken God's law and would stand before him guilty on judgment day. We agreed that Hell would be reasonable for lawbreakers. Then we shared the glorious gospel with them and explained that Jesus' death was a legal transaction where Jesus was paying their "fine" so that God's wrath would be satisfied. We left them with gospel tracts and new testament bibles. Please pray for this young couple that the Holy Spirit would bring our conversation to remembrance and draw them to Himself. Please pray for the team going to the Irvine Spectrum tonight. Pray for boldness and protection. Pray for those who will hear the gospel. Also pray that God prepares the hearts of those who we will encounter tonight. Pray that the Holy Spirit will bring conviction of sins and grant people repentance and faith in Jesus. Pray that the team will be willing instruments in God's hand and that "the flesh" does not take over in the form of pride. Pray that God will keep the security guards from standing in the way of the gospel and also pray for the team to be sensitive to the mall rules. Pray that the Holy Spirit will come upon people in such a powerful way that they are powerless to stand against the call of the gospel. Pray that their eyes will be opened to the incredible gift that is laid before them. Pray that the bonds of sin will be cast off and that no sin would be so powerful as to hold somebody back from repenting and trusting in Christ. Pray that God would raise up more laborers for the harvest. The fields are white! Thanks brothers and sisters in Christ!